Oxymagic's most important asset is our customers. We are truly humbled and grateful for all the kind emails, testimonials and referrals. We Thank you for the trust and confidence that you have placed in Oxymagic. We hope to continue our valued relationship for years to come. Each OxyMagic franchise is individually owned and operated. We are not related to other "Oxy" companies in Charlotte. In fact, we FIX cheap carpet cleaning jobs and those of other Oxy cleaners every day! OxyMagic carpet cleaners provide excellent carpet cleaning services. Each carpet cleaning franchise is individually owned and operated by people that are passionate about clean carpet. Throughout the lifetime of your carpet the fibers are subjected to the day to day under-foot grind of typical household spills, dirt, children, pets and after a while it can all take its toll. OxyMagic uses the power of oxygen to clean a wider spectrum of soils that other cleaners may not get out. With the OxyMagic system, average dry time is reduced to 30 to 90 minutes, which eliminates the chance for old stains to return and for mold and mildew to form. OxyMagic's NaturesWay® cleaning solution and process provides a healthier home environment from common household contaminates. OxyMagic’s removal of common contaminates will insure a cleaner home environment for you and your family. For many years, customers thought that the only way to get their carpets clean was to use a steam cleaner - which resulted in carpet that stayed wet for days & sometimes smelled like mold & mildew. Sometimes the carpet shrank from the hot water/steam application and required re-stretching. Worse yet, sometimes steam cleaning would make carpet stretch or expand, creating buckling, wrinkles and humps. If you've ever been in someone's house where the carpet was no longer flat to the floor all over, there's a strong probability that hot water extraction caused that problem. In the 1970's a supposedly revolutionary cleaning method was introduced - bonnet cleaning. Bonnet cleaning basically takes a towel and swirls it around on the top of the carpet using a machine - which results in distorted carpet fibers, lots of loose fiber that sheds after cleaning, and not much dirt is pulled out of the carpet. The absorbability of the towel or bonnet is the limiting factor in how much dirt can be pulled up. This cleaning method is still used by various "orange", "citrus" and "solution" cleaning companies. The process just swirls dirt around - basically evenly distributing the dirt across the entire carpet surface instead of really cleaning. THEN OxyMagic came along and finally revolutionized carpet cleaning! 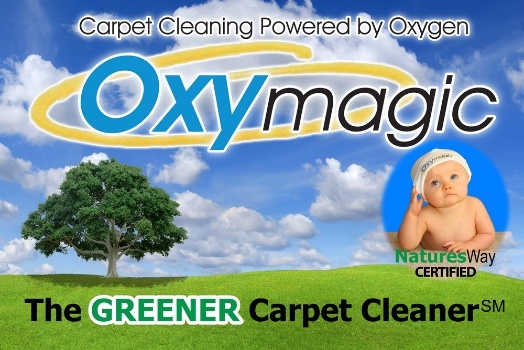 We use a SAFE NON-TOXIC cleaner, NaturesWay® - the GREENER Carpet Cleaner, developed for EXCLUSIVE use by OxyMagic franchise owners. Combine our cleaner our unique carpet cleaning machine that actually LIFTS THE DIRT OUT of the carpet and you have a method that CUSTOMERS LOVE! Gone are the days of wet, moldy, and not-so-clean carpet. OxyMagic offers a revolutionary way to get carpet clean! Carpet stays cleaner longer & dries in 30 to 90 minutes! OxyMagic of the Carolinas covers most of the Metro Charlotte region including: Charlotte, Cornelius, Davidson, Sherrills Ford, Denver, Stanley, Huntersville, Charlotte, Mint Hill, Matthews, Weddington, Waxhaw, Fort Mill, Indian Land, Rock Hill, Steele Creek, Tega Cay, Belmont, and Mount Holly. OxyMagic of the Carolinas, LLC. Each franchise is independently owned and operated.